A number of haiku-engraved stone slabs can be found throughout the greenery of Hikone, relics left from the Edo Period (1603-1868), featuring the haiku of such famous poets as Matsuo Basho, and his pupil Kyoriku Morikawa. Such slabs are on display at Hikone's Haiyu-kan Hall, which also holds other haiku-related exhibitions. The Haikyu-kan is located within a retro Taisho Period (1912-1926) bank building, which makes for a striking exterior. 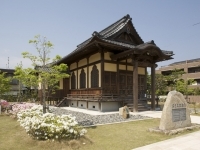 It is also the base of operations for Hikone's Volunteer Guides.